Muzmo.Org » Music collections » Bachelorette: "House of Cards"
“Hen Party” is a series of playlists with music specially selected for female characters from TV shows and movies. 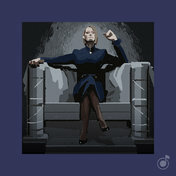 Calm and cold, the heroine of the "House of Cards" Claire Hale Underwood achieves her by all means: for her the end always justifies the means. A selection of dark and mysterious music - from the curator Tanya Darya. Listen to the collection Bachelorette: "House of Cards" in high quality, absolutely free. You can listen to the whole collection, or separately song by song. In addition to Bachelorette: "House of Cards" of the collection, you can find any other one by following the link and get information with the already collected collections and collections of tracks, songs and music.